Mercy, it’s hot! We are in a heat wave that is unusual for this early in the summer. 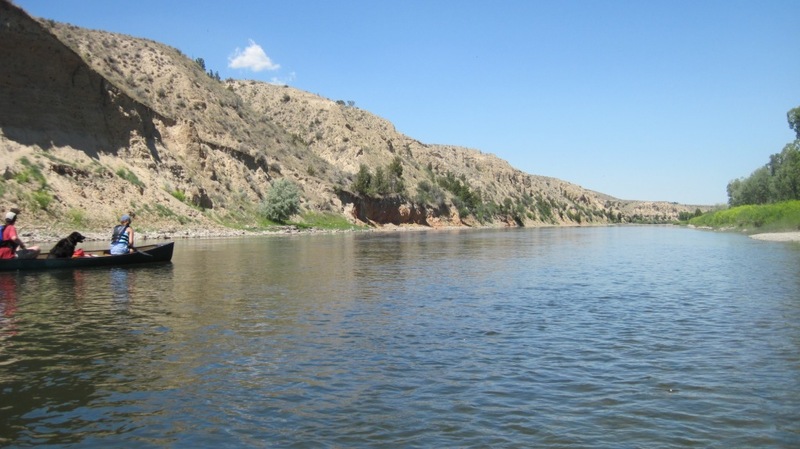 Yesterday, on the way home from an awesome float trip (see more below), my car thermometer showed 102 degrees F. I’m not sure we’re quite going to hit 100 again today, but 99 degrees is the forecast. As if that makes a difference. And tomorrow’s forecast is for 101, so that’s just as encouraging. The long-term forecast for the next week shows highs in the upper 90s for the first part of the week, then mid- to low-90s the latter half of the week. Misery in a house with no air conditioning. Fortunately, we have a little set up that helps keep the house at least somewhat bearable in the mid to late afternoons. Last summer Hubby bought an oscillating fan on a stand that we put at the bottom of the stairs to the basement. When turned on and pointed up the stairs, it brings up a pretty nice breeze of basement-cool air. Then once 9pm rolls around, it’s usually cool enough to open up the windows and screen door to the deck for the evening. It’s not cushy, but it’s not completely uncomfortable. Last night I was too tired to cook–after spending several hours in the sun, my energy was sapped. When I mentioned this to Hubby, he pounced–“Can we get pizza? !” I was fine with that–he mentioned take and bake, but I vetoed on the account that there was no way in hell I was going to allow the oven to be turned on to cook a pizza and my solar oven isn’t big enough to cook a round pizza larger than about 8 inches in diameter. He hadn’t really considered this point, so we ordered a couple of pizzas from our local wood-fired pizza joint. Today, though, I brought out the solar oven to make a batch of cherry chocolate chip cookie bars and tonight’s dinner–pesto potatoes with Swiss chard, collard greens, parsley, oregano, green onions, and carrots (most of which came from the garden). I got a late start on the potatoes, and a few high clouds moved in, so the potatoes didn’t quite finish cooking. Never fear, though, when the pressure cooker is available–another 7 minutes under intense pressure and those potatoes were fork tender and ready to eat! While the potatoes were cooking in the solar oven, though, I decided it was finally time to get the bags of garlic scapes out of the refrigerator and into the freezer in the form of pesto. Since I have about 300 bulbs of garlic growing in my gardens, I’ve had an overwhelming supply of garlic scapes this year in addition to what we have gotten with our CSA share. Wait, what? Did I say overwhelming? Nah, just kidding…it only seems a little overwhelming because I haven’t had time to do anything with them yet, but I only harvested the last of them today, and so it made sense to hold them until I could have one marathon pesto-making session. Maybe this hasn’t been made clear in some of my recent posts, but I have a slight love affair with pesto. And I am more than happy to have so much pesto to put in the freezer for this winter. All of them smelled delicious as I made them and I can’t wait to try them all, but I am most intrigued by the sesame pesto, thinking of stir fried veggies and rice noodles covered in this pesto. And finally, yesterday. Hubby, Stinker, Stepdaughter #2, and I had a lovely 3 hour float trip in our canoe and kayak. I was in my kayak and everyone else was in the canoe. We’ve had this trip planned for a week now, and seeing how the weather was ridiculously hot, it seemed like the most serendipitous way to spend our Saturday. Yesterday was a really fun day, but we had a bit of a scare when we got home. We have an old ottoman that Stinker uses to get in and out of the truck, since it’s so tall. As she was hopping out, the ottoman slipped out from under her and she landed really, really hard on her left side. She let out a yelp and didn’t move, just laid on the driveway whimpering and shaking in pain. Stinker is a tough doggie, and she only yelps if the pain is really intense. When she didn’t get up, we thought maybe she’d done herself in, and a little bit of panic set in. It was a sickening feeling, and I felt my stomach turn with dread. Hubby called the vet’s emergency line and we had to wait for the vet on call to call us back. After about 5 minutes of not moving, she managed to sit up and hobble over to the grass. She was limping badly, but since it was 100 degrees, we needed to get her into the shade. She walked into the basement (thank goodness it’s a walk out basement) and I made her lay down again. Hubby finally talked to the vet, who said she probably landed on the point of her shoulder bone, which can be incredibly painful if hit just right. She suggested that we give her a pain pill and monitor her for a while, to save ourselves what would surely have been a humongous vet bill. Stinker was able to climb the stairs to the main part of the house on her own, and she ate her food with her pain pill. After a while she seemed to be feeling much better. We even gave her a bath, which made her feel even better. She did not, however, beg for a walk that evening, which has never, ever happened. We were glad, though, because we wanted her to rest as much as possible. This morning she was anxious to go for a walk and she took me on a long one–we even went on a trail! She was no longer limping, and she seemed back to her old self. We’re still not sure exactly why she couldn’t get up after falling–maybe the pain was so intense that she couldn’t move or maybe she just got the wind knocked out of her. But suffice it to say that we are all so very relieved that Stinker is okay. We still might take her to the vet this week for an X-ray to make sure she didn’t chip the shoulder bone, which could cause problems later. Based on the goofy smile that has been on her face practically all day, you’d never guess that she’d done anything so traumatic the previous day (I’m sure the extra bellyrubs and treats have nothing to do with it). We feel fortunate that such a grand day didn’t end in tragedy and we’re all ready to get back on the water next weekend! 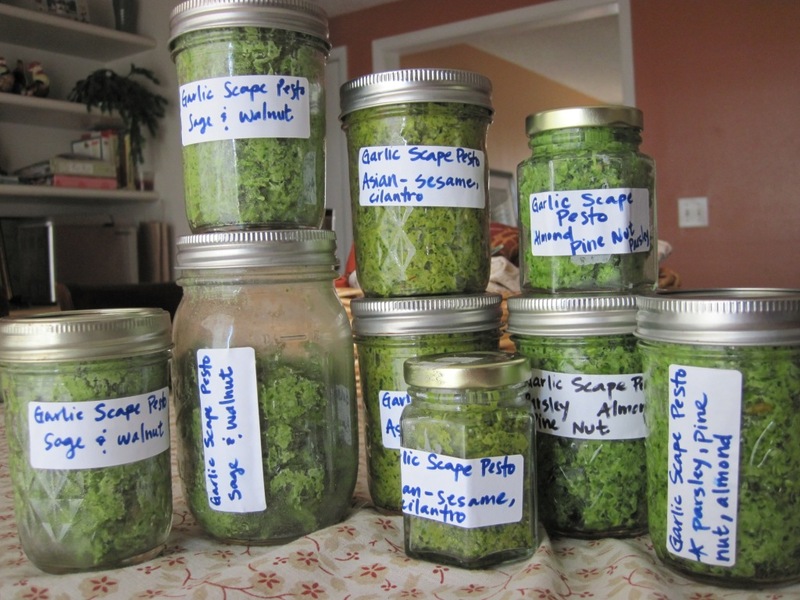 This entry was posted in CSA, Food, Garden and tagged Asian pesto, canoeing, CSA, garden bounty, garlic scape pesto, garlic scapes, heat wave, kayaking, parsley and pine nut pesto, river travels, sesame pesto, solar cooking, solar oven, walnut and sage pesto. Bookmark the permalink.